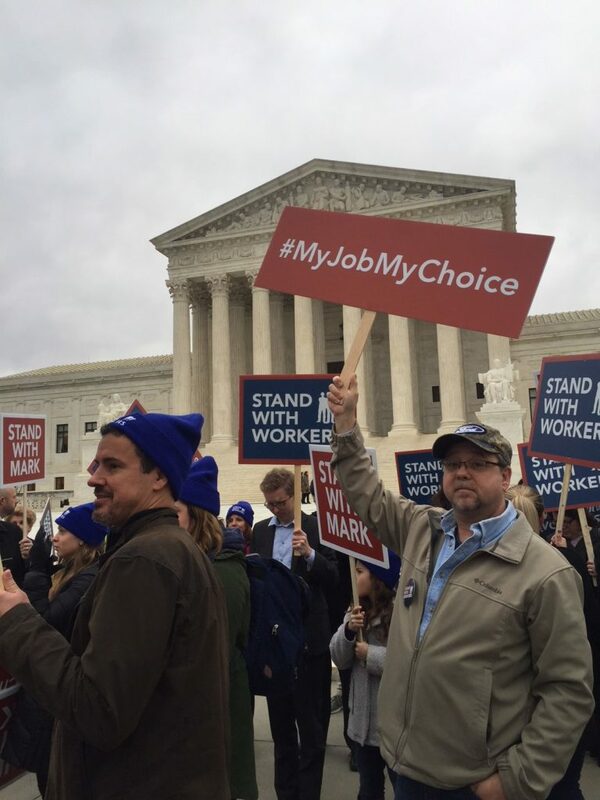 The U.S. Supreme Court decision in Janus v. AFSCME has cost Connecticut’s public sector unions millions in lost agency fees, but now those unions are pushing back through legislation to give them more control and influence over state and municipal employees. A committee bill passed out of the Labor and Public Employees Committee would turn over state employee personal information to union leaders, give union officials access to new employee orientations, allow them to use public facilities for meetings, limit a court’s ability to award damages against a union for violations and make dues authorizations in union membership cards a matter of state law. The Janus decision in June of 2018 prohibited unions from collecting “agency fees” from non-members. Nearly 11 percent of state employees who are members of a bargaining unit but not union members are no longer paying agency fees. In response, some unions have attempted to limit when and how employees can resign membership or no longer have dues deducted from their paychecks, but House Bill 6935 would allow the union officials to have greater influence over an employee’s decision whether or not to join the union or remain a member. State employees will have all their personal contact information, including personal email, home phone and cell phone numbers, turned over to a state union, and union representatives will have access to a new state or municipal employee’s orientation training. The employee’s personal information would only be available to the union and the bill would prevent access to the information by other entities which may encourage members to resign. Following the Janus decision, some unions reported that workers received mailers or email communications from organizations encouraging members to resign. The employee contact information had been obtained under the state’s Freedom of Information law. The bill would make it a prohibited labor practice for the state or municipality to knowingly share worker information with outside organizations. Members who want to resign from the union will only be able to appeal to the union, rather than the state or municipality, but the bill partially protects the unions against legal action by employees who file suit over dues payments in light of the Janus decision — one of which has been filed in Connecticut. Two state employees from the Department of Energy and Environmental Protection have filed a class action lawsuit against SEIU Local 2001 for agency fees dating back to 2015. The employees are represented by the National Right to Work Foundation. “Unfortunately, rather than win the voluntary support of workers, Big Labor and their allies in government are shamelessly doubling down on the use of coercion to trap workers into financially supporting union activities,” Semmens said. The number of agency fee payers for SEIU Local 2001 ranged from 714 in 2016 to 445 in 2018, according the union’s LM2 filings, and a decision against the union could add up to a big payout. The plaintiffs were part of the state’s P-4 bargaining unit. According to numbers supplied by the State Comptroller’s Office, non-union employees paid $752 per year in agency fees. As of April of 2018, there were 168 agency fee payers in that bargaining unit alone, meaning a potential win for the plaintiffs could add up to a major cost for the union. Similar lawsuits around the country are looking to collect years’ worth of union dues and agency fees have begun popping up around the country in the wake of Janus. The legislation stipulates the union doesn’t have to provide documentation to the state that a new employee has joined the union, unless the employee challenges his or her membership and dues deduction. Under the Supreme Court’s Janus decision, a non-member – like a newly hired employee who has yet to sign a union card — must “affirmatively consent” to union membership and dues deduction through signing a union card. Union membership cards contain language allowing unions to continue collecting dues until a particular window of time even if a worker resigns membership, leading to some employees who resigned having to continue paying dues for a period of time. Authorization windows have been challenged in court in other states, but the bill would essentially make the windows a matter of state law. An Act Concerning the Right of a Public Employee to Join or Support a Union passed out of the Labor and Public Employees Committee along a party-line vote with one abstention.